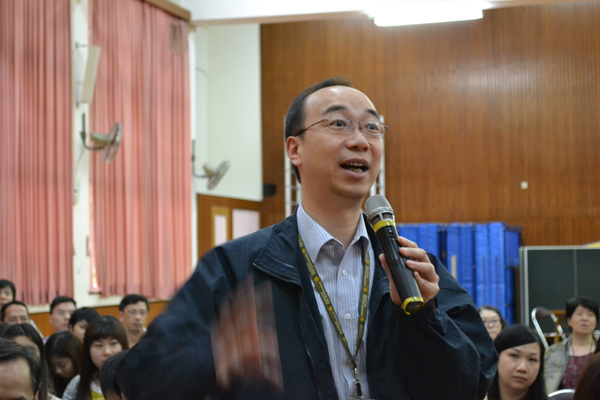 The fifth PDS seminar entitled ‘Use of Apps in Teaching and Celebration of Success’ was held on Tuesday, 8th July 2014 from 2:30 p.m. – 5:15 p.m. at SKH St. Mary’s Church Mok Hing Yiu College. 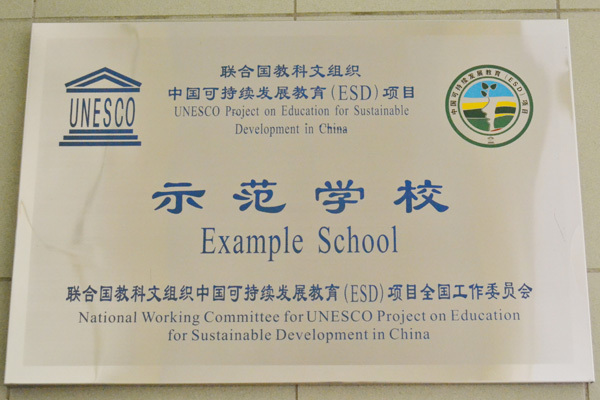 The workshop was a joint venture, attended by 24 persons from 6 schools, including our school, three partner schools and two other schools. 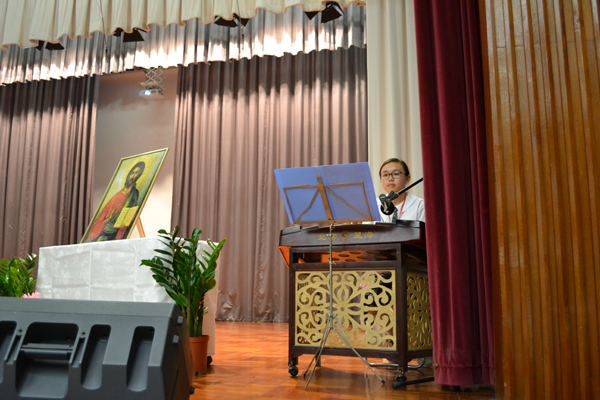 There were 5 teachers from SKH St. Mary’s Church Mok Hing Yiu College, 2 teachers from Confucian Ho Kwok Pui Chun College, 4 teachers from St. Stephen’s Girls’ College, 4 teachers from HKFYG Lee Shau Kee College, 4 teachers from Ching Chung Hau Po Woon Secondary School and 5 staff members from our school. 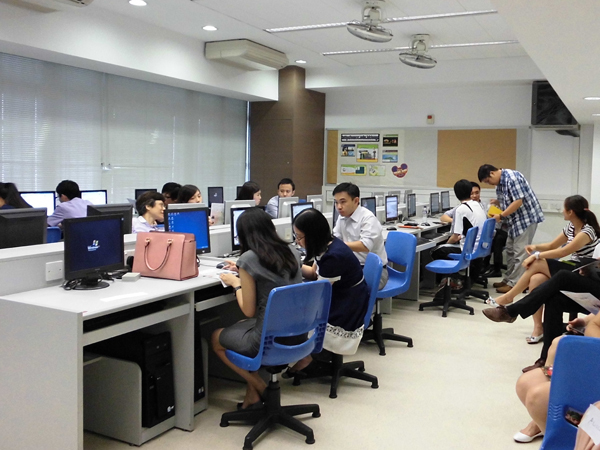 Seconded teachers from the two other schools were invited to share their experience of using Google Apps to enhance interaction between students, arouse their interest in their studies and address learner diversity. 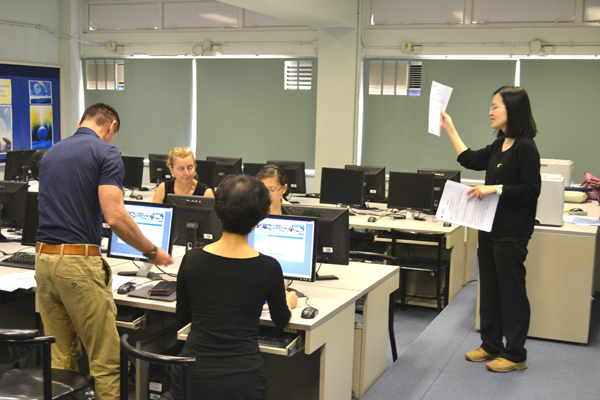 In addition, teachers discussed the design of their exam papers as well as the feedback they had got from their students after trying out new teaching practices. 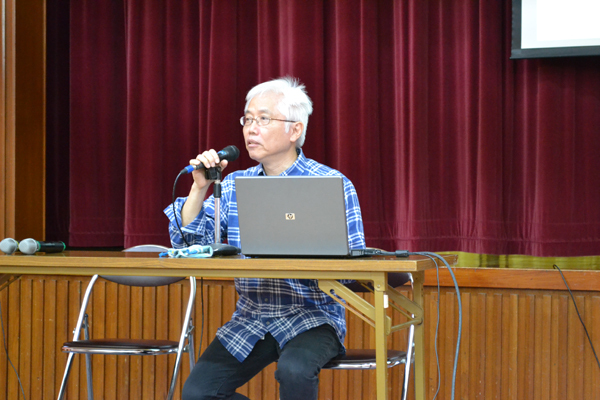 The workshop was held in the primary school hall on 9th June from 9 am to 1 pm. 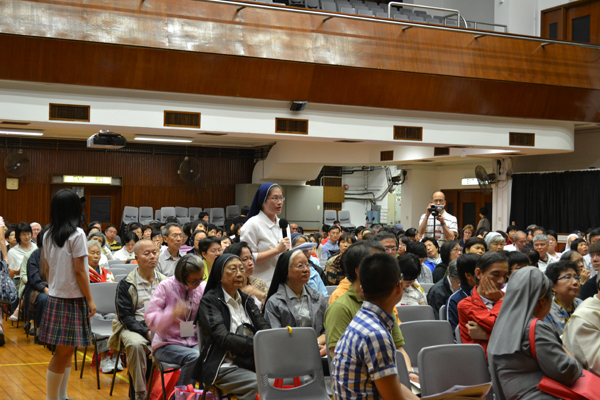 Around two hundred teachers coming from the primary and secondary section of St. Paul’s Convent School and St. Pual’s Secondary School participated in the workshop. 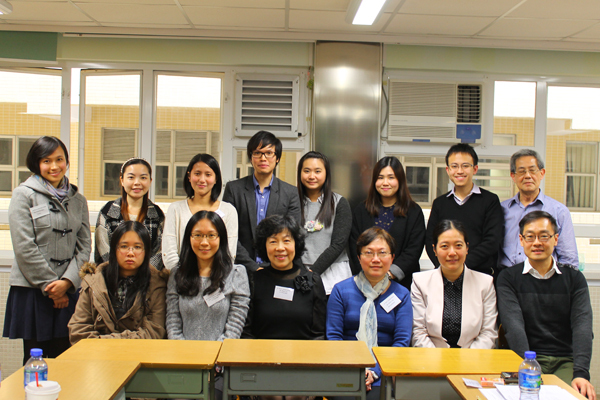 It proved to be successful and fruitful as the speakers, Professor Chris Lam and Solicitor Ms. Vera Lam gave valuable information on legal issues in school. 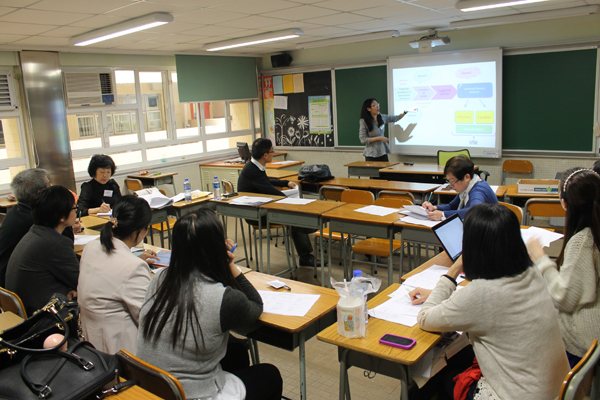 On the 21st May 2014 teachers from English, Chinese and Maths Department attended a workshop for student assessment conducted by the HKEAA. 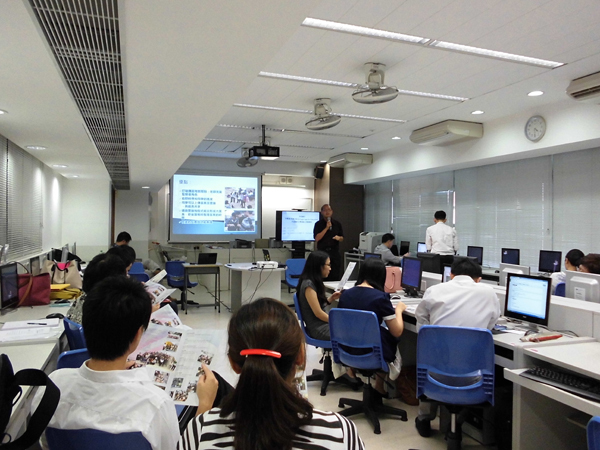 The workshop aimed at introducing to teachers the "Student Assessment" system. This SA system is an online assessment tool that allows teachers conduct assessment according to their students’ needs and learning progress so as to enhance the effectiveness of student learning. 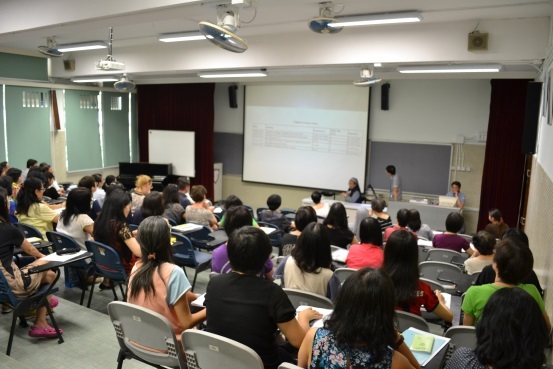 The Fourth PDS Liberal Studies seminar entitled 'Approaches and Pedagogy in Understanding Major Concepts in the Liberal Studies Curriculum ' was held on Wednesday, 26th March 2014 from 3:00 p.m. – 5:00 p.m. at St. Paul's Convent School. 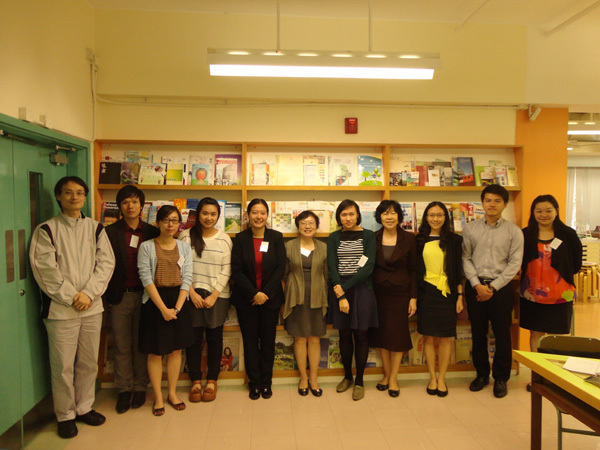 A total of 12 persons from our school and two partner schools attended the seminar, including 3 teachers from Ching Chung Hau Po Woon Secondary School, 4 teachers from St. Stephen's Girls' College and 5 staff members from our school. 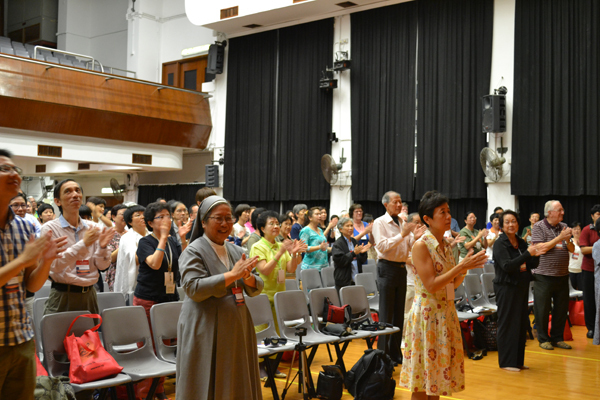 Teachers of HKFYG Lee Shau Kee College could not attend the seminar as they had a staff development program in their school on that day, but they had arranged for their materials to be presented at the seminar by a teacher from Ching Chung Hau Po Woon Secondary School. 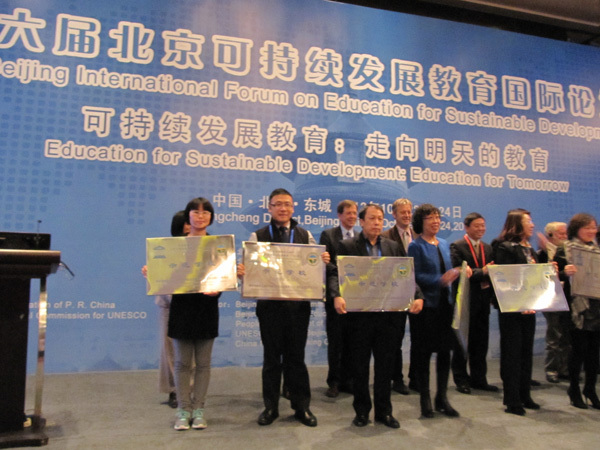 Pedagogies and approaches to understanding concepts in four major areas, namely, rule of law, governance, globalization and sustainability, were presented. 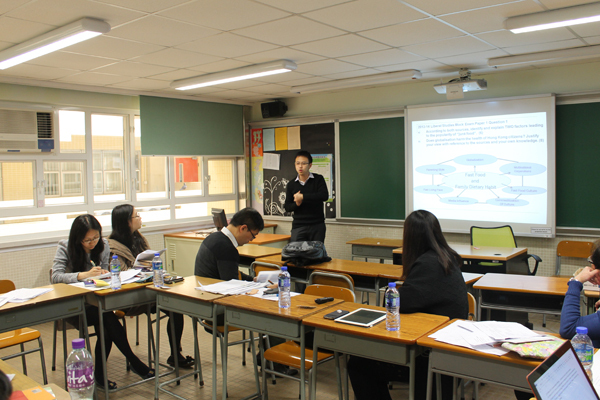 All the presentations clearly demonstrated the professional expertise of teachers. 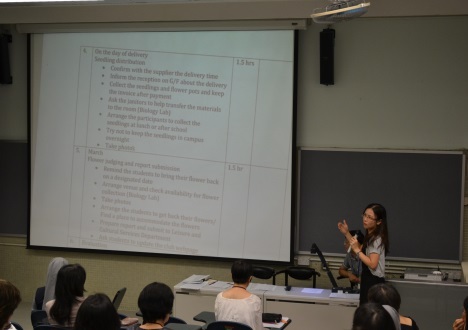 The seminar focused on the planning and designing of the curriculum flow and provided an insight into more effective ways of delivering lessons to meet students' needs. 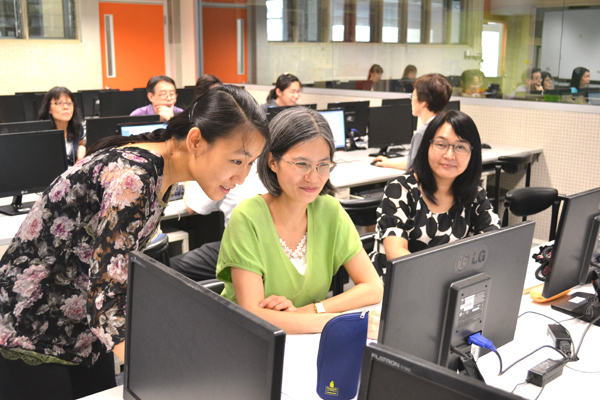 The discussions among teachers revealed their interest in exploring ways to help students master the more difficult concepts through current news and daily life applications. 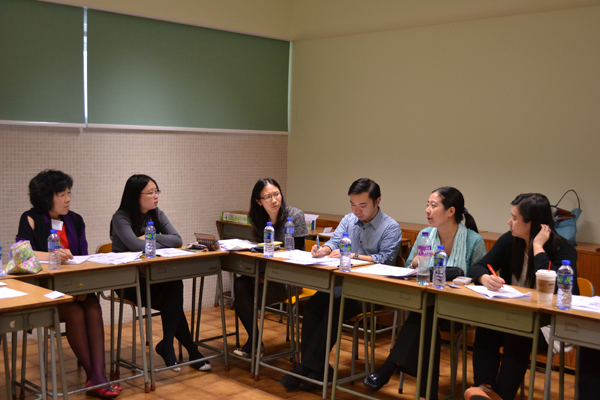 The third PDS seminar entitled 'Analysis of Mock Papers Design' was held on Wednesday, 26th February 2014, from 3:00 p.m. – 5:00 p.m. at St. Paul's Convent School. 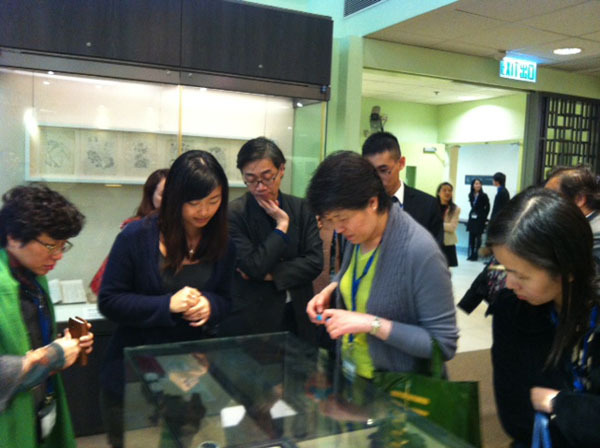 A total of 14 persons from our school and three partner schools attended the seminar, including 3 teachers from Ching Chung Hau Po Woon Secondary School, 3 teachers from HKFYG Lee Shau Kee College, 2 teachers from St. Stephen's Girls' College, 5 members of staff from St. Paul's Convent School and 1 from the EDB. Representatives from each school shared their experience of designing mock exam papers to prepare students for the public exam. It was found that students from these schools faced more or less similar problems, such as not having the skills to answer questions which demanded the application of high level concepts, especially in areas of politics and governance. 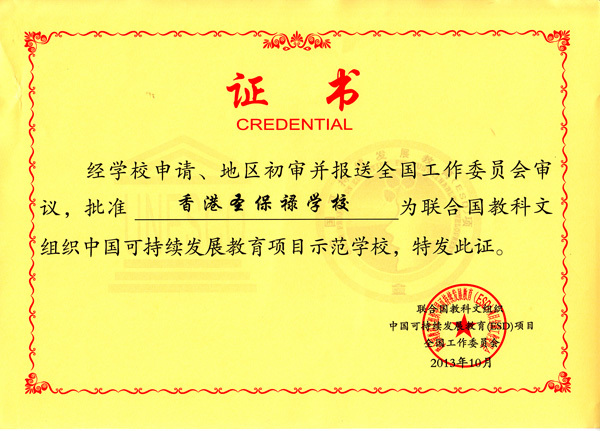 It was suggested that teachers help students to master advanced answering skills and also have greater confidence in tackling topics related to China. 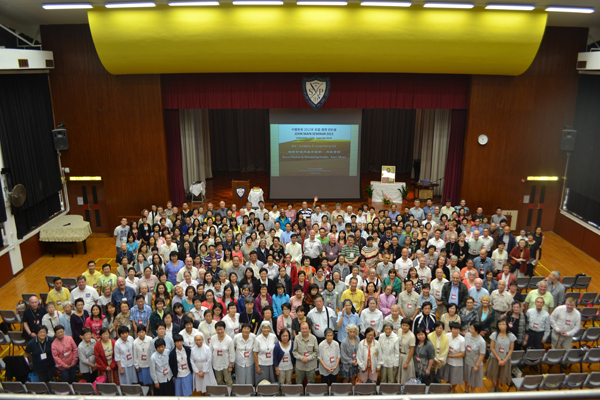 On 8 January 2014, four teachers visited the Hong Kong Baptist University on her Secondary School Principals’ Day 2014. The main year theme was “Life Brilliant Quote: Inspiring Firs-Year University Experience”. 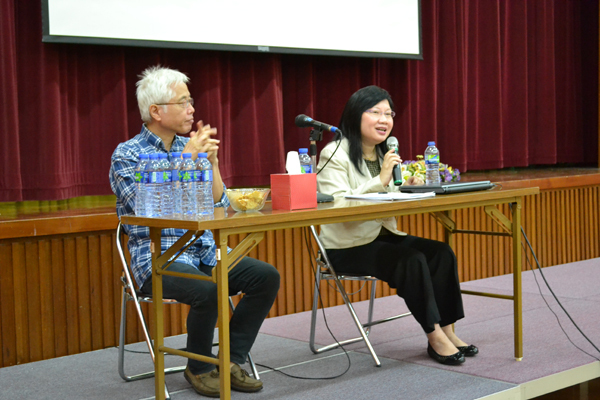 The programme started with the sharing form Dr Mosses Cheng, The Chairman of Education Commission, and the Director of Student Affair and student representative on their first-year experience in relation to their personal growth and inspiration to achieve their life goals. 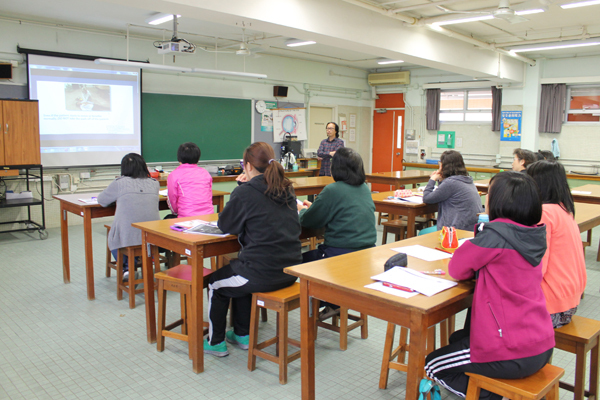 Then, the teachers joined various parallel sessions which included: Science in Entertainment; First-hand Experience in Chinese Medicine Knowledge and Education; Journalism Education: Change and Moving Forward to better understand the some study programmes and the admission criteria of the university. 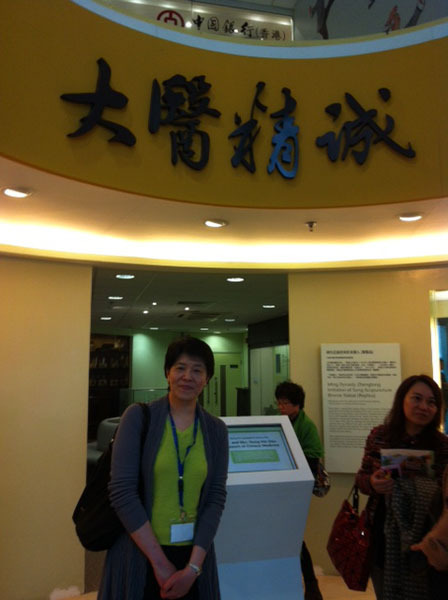 We found the Principals’ Day informative and had a fruitful day. 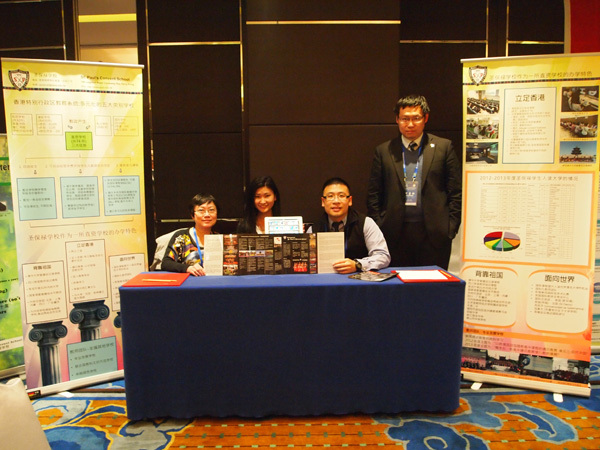 From 12th to 14th December 2013, 38 of our teachers joined the Expo and the Conference both held at the Hong Kong Convention and Exhibition Centre. 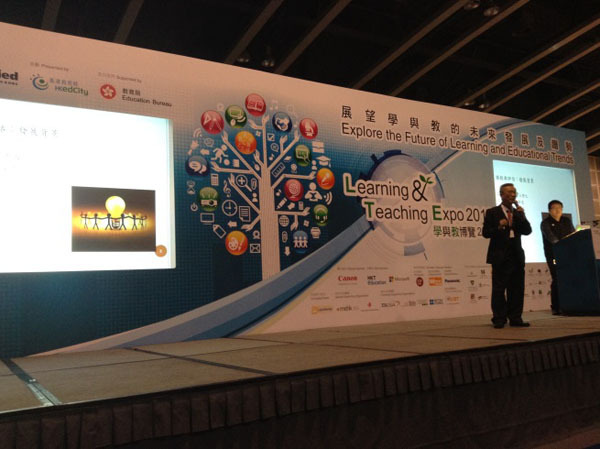 The objective of the Expo is to provide an opportunity for teachers and school leaders to explore educational trends and discover the latest learning and teaching resources and technology. 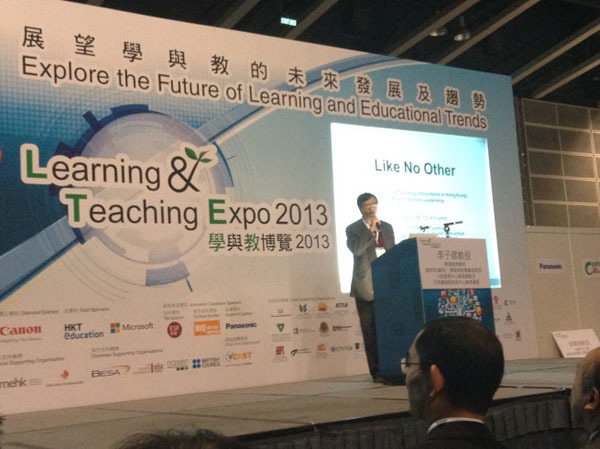 The Expo is jointly organised by Hong Kong Education City and fully supported by the Education Bureau. 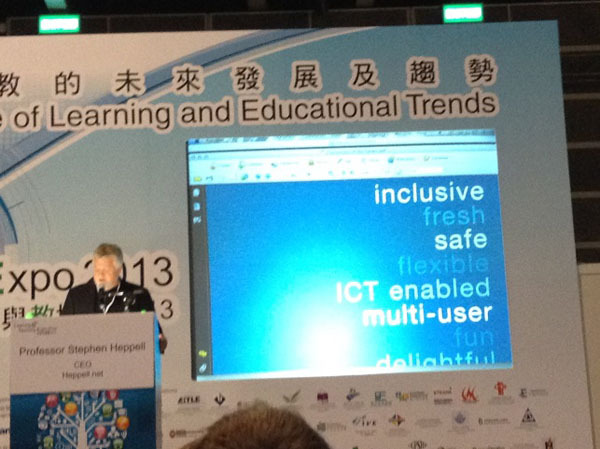 The main theme of the 21CLHK is “The Digital Learning Imperative” and the conference runs alongside with the Expo. 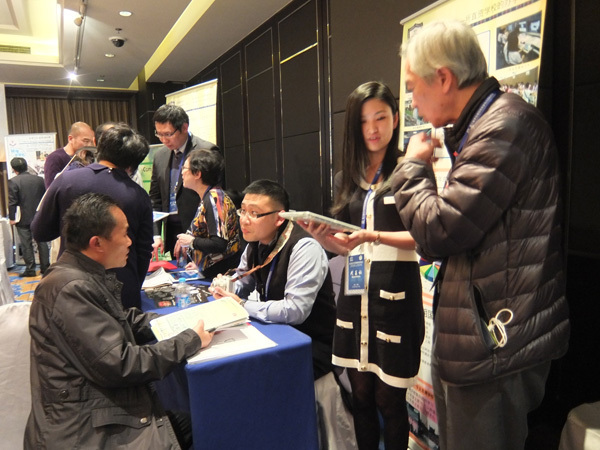 Our teachers found the keynotes, seminars, workshops and the exhibition booths at both conferences informative, inspiring and motivating. 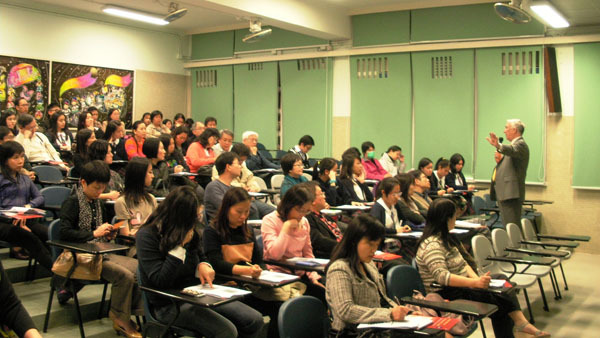 The seminar was held in our school on 11th December (6 – 8:30 pm) and attended by parents, teachers and students from our school as well as the general public. It proved to be very successful, with detailed information being provided on the changes to the GCE A Level qualification and the new International Advanced Level (IAL) qualification being introduced. 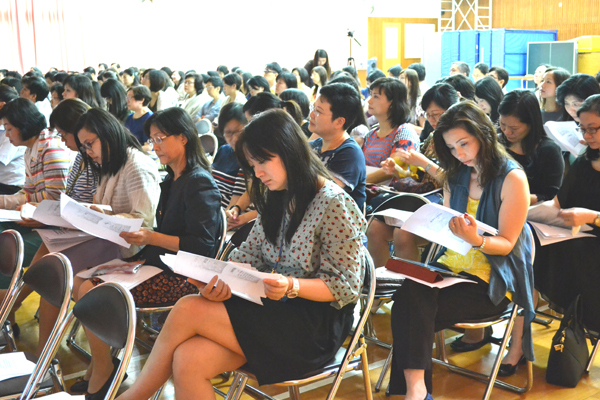 Parents raised many relevant questions after the extremely informative presentation by Dr. David Davies. 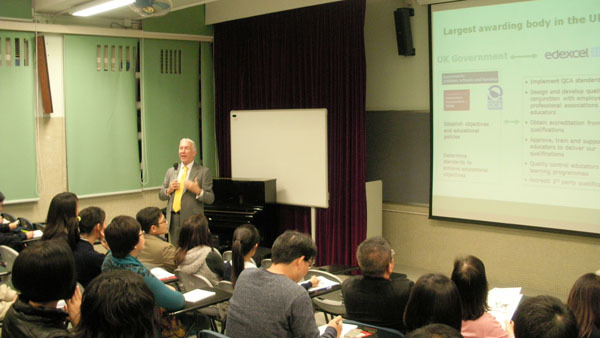 Students and parents were pleased to learn that the IAL is widely recognized by universities all over the world. 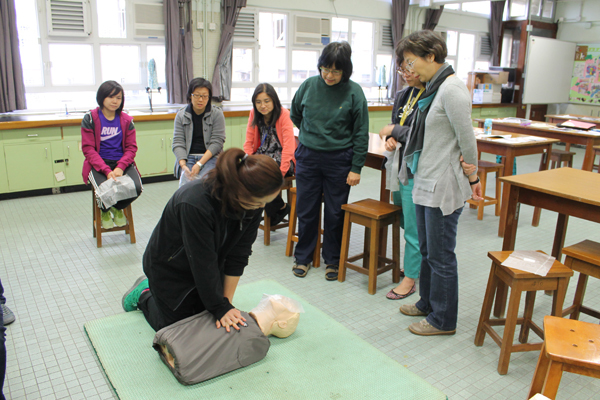 On 9th December 2013, 10 teachers attended a full-day training course in CPR and the operation of the Automated External Defibrillator (AED), organised by the Hong Kong College of Cardiology through the Jockey Club’s ‘Heart-safe School’ project. The project, which aims to develop schools into heart-safe premises, is supported by the Education Bureau and the Department of Health. 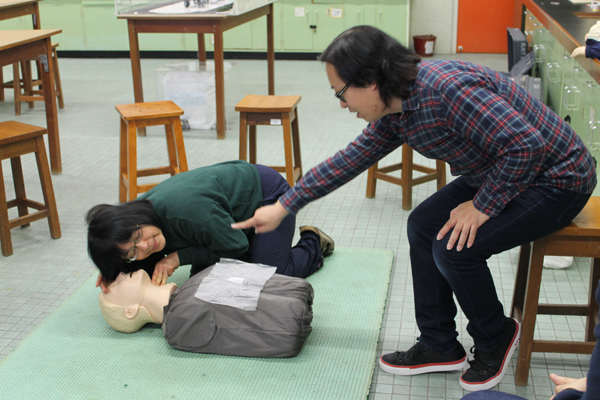 Through this training course, teachers’ awareness of how the defibrillator can be used to reestablish an effective rhythm in the heart in case of a sudden cardiac arrest was raised. 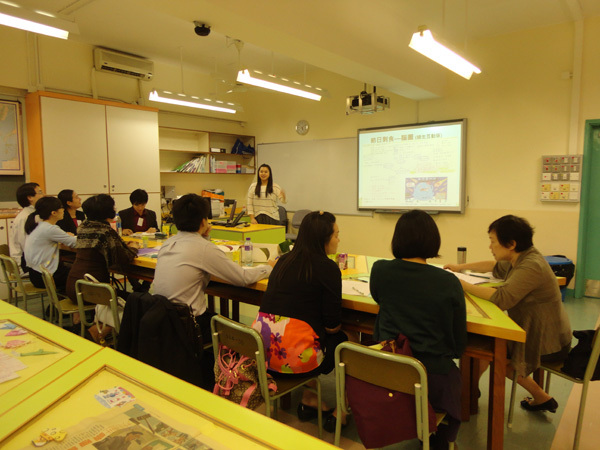 It was a valuable experience for teachers. On the 13th and 20th November 2013 the British Council carried out 2 hands on and practical workshops primarily for English teachers that introduced our teachers to some of the basic functions of iPads and how they can be used in a pedagogically sound way in the classroom. 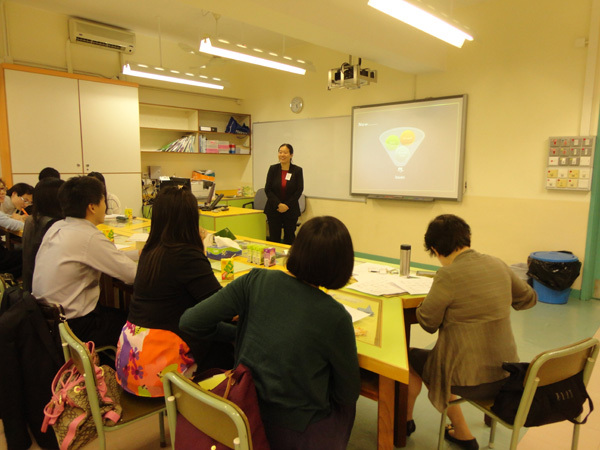 The emphasis was on giving the teachers lots of practical ideas on how they could integrate iPads into their teaching in ways that are linked to the curriculum. 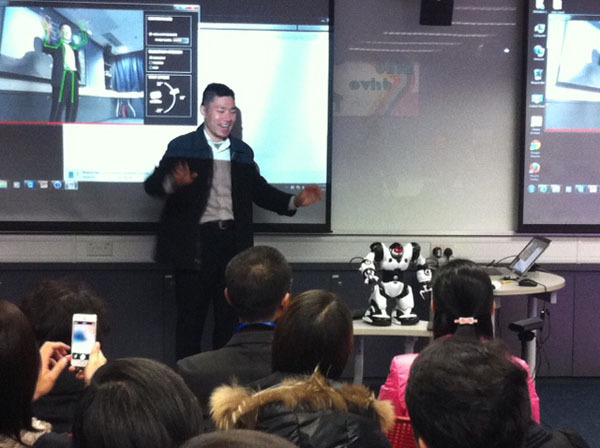 We also looked at some very useful apps that will help develop learners’ creativity, critical thinking, collaboration and communication skills. In the 2nd workshop the focus was extending and building on our teachers’ knowledge and skills in using iPads in the classroom. 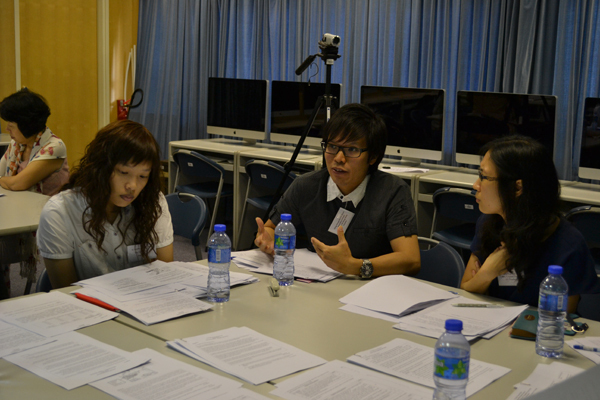 Again, this session was highly practical and linked to the curriculum. We looked at when, why and how to integrate this technology into lessons and reflected on a range of practical tasks and activities using different apps. Practical tasks included looking at ways of building up learners’ speaking fluency and developing their writing skills. The kind of apps and activities we used in the workshops included: brainstorming and organizing apps, digital storytelling, the creation of screen-casts and apps that allow assessment for feedback. 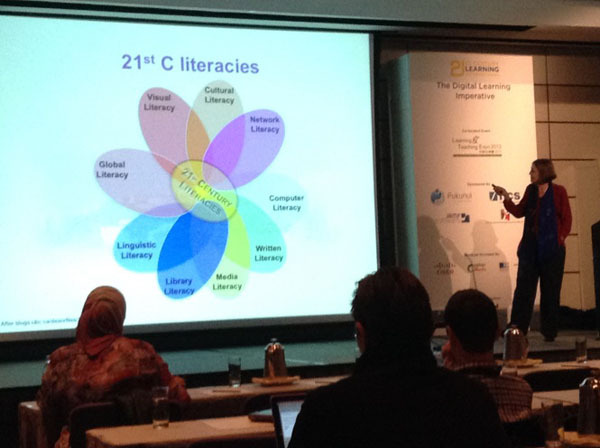 Teachers gained exposure to a wide range of apps that can be used in many different ways that will help develop learners’ digital literacy as well as in turn support traditional literacy skills. 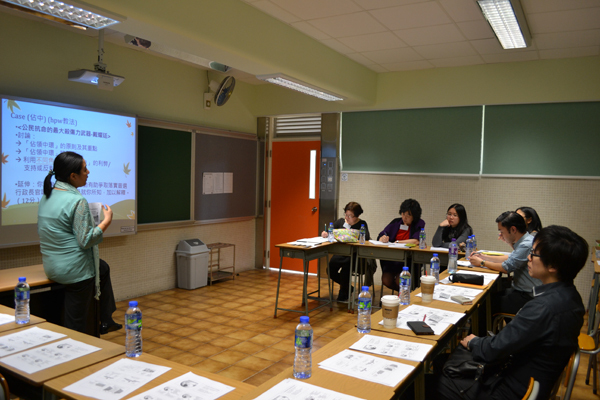 The Second PDS Seminar entitled ‘Consolidation of Integrative Skills by Conceptualization’ was held on 6th November 2013 at Ching Chung Hau Po Woon Secondary School. 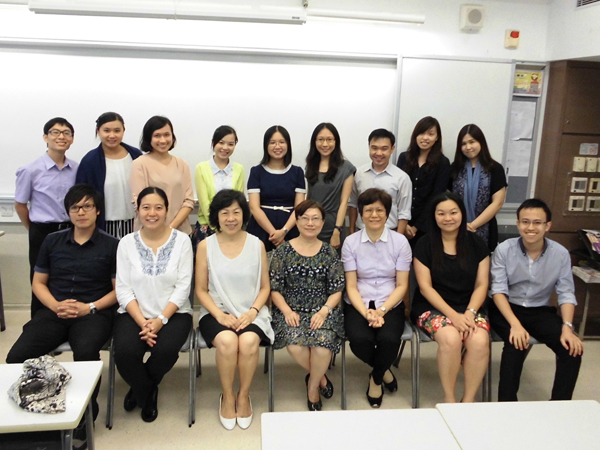 Teachers from our school and 2 partner schools (Ching Chung Hau Po Woon Secondary School & HKFYG Lee Shau Kee College) together with members from EDB attended the seminar. 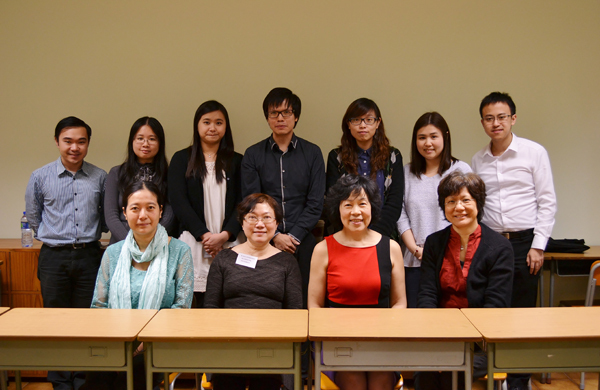 Teacher representatives from Ching Chung Hau Po Woon School shared their experiences of helping students in mixed-ability classes and presented an insightful analysis of question types and teaching pedagogies in relation to the curriculum. 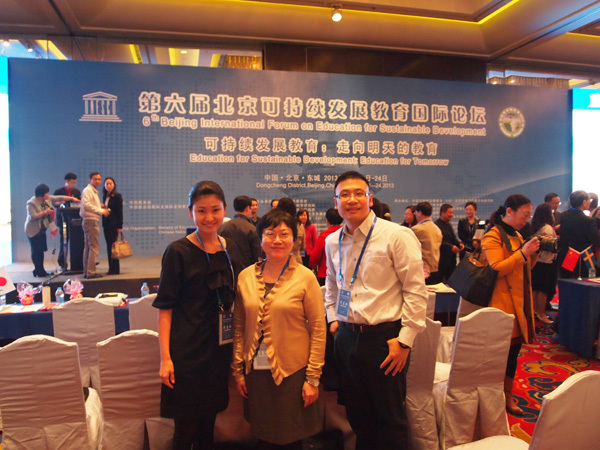 Finally, the formation of working groups among teachers to facilitate a professional dialogue regarding the effective conceptualization of enquiry topics and innovative learning-teaching pedagogies was discussed. 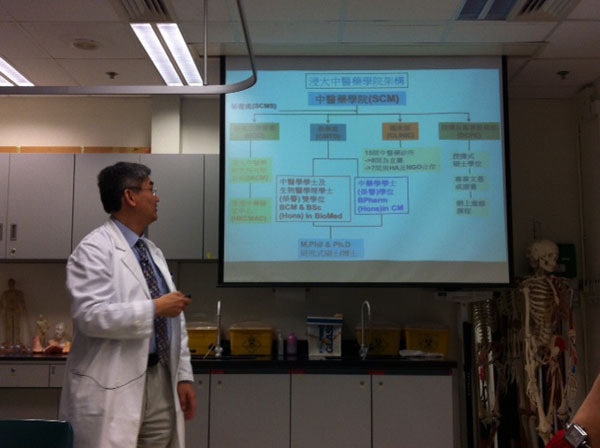 These working groups were expected to be functional from mid November 2013 to April 2014. It was inspiring to see how students with different academic abilities were motivated by innovative teaching pedagogies and were able to take ownership of their learning and work in collaboration with their teachers. 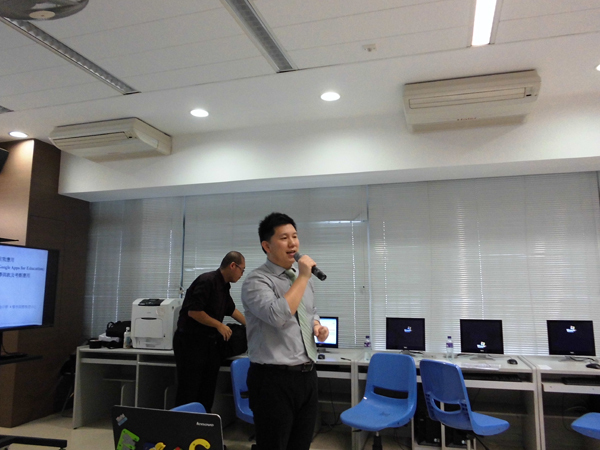 Mr R Li, Mr SW Law and teachers involved in iBook development attended Apple training sessions on the use of iPad and ibook Author on 23 October 2013, and the application of iTunesU on 31 October 2013 in classroom teaching and learning. 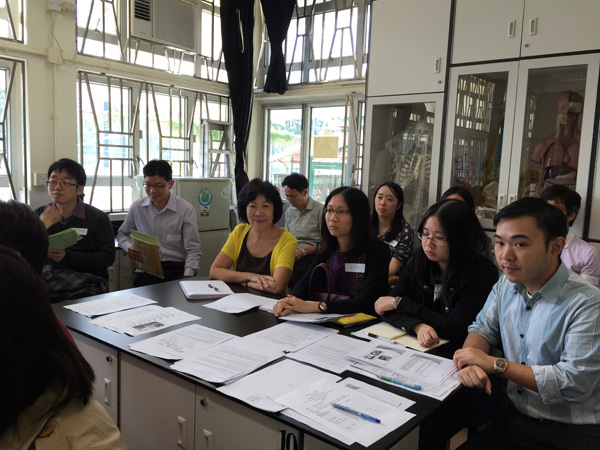 On 18th October 2013, 10 teachers from Hong Kong and Macau attended the captioned workshop, which was held in the newly renovated multi-purpose Conference Room at our school. 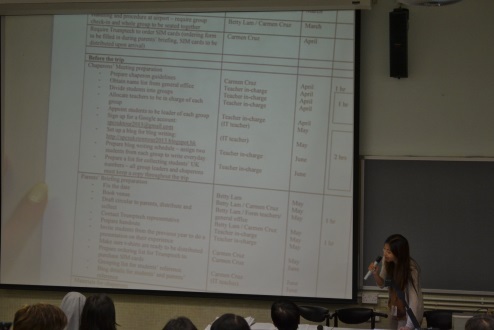 The aim of this workshop was to bring into focus issues such as the planning of the new IAL Mathematics course and the preparation of students for examinations. 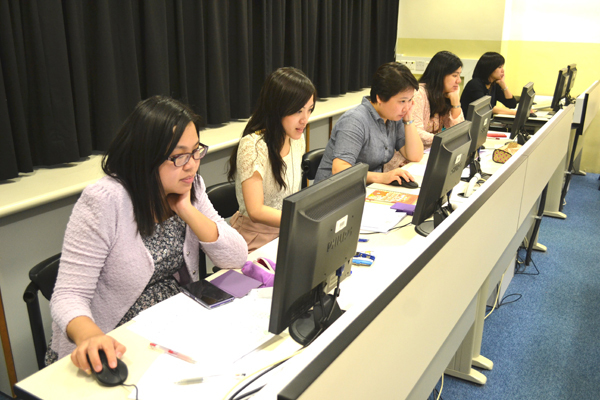 The workshop was conducted by Mr Joe Petran, an experienced GCSE and GCE Mathematics examiner and trainer. 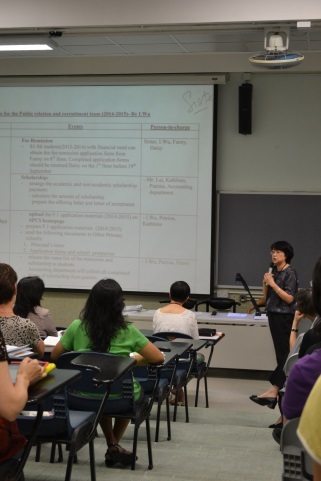 All participating teachers found this training workshop very informative and useful. 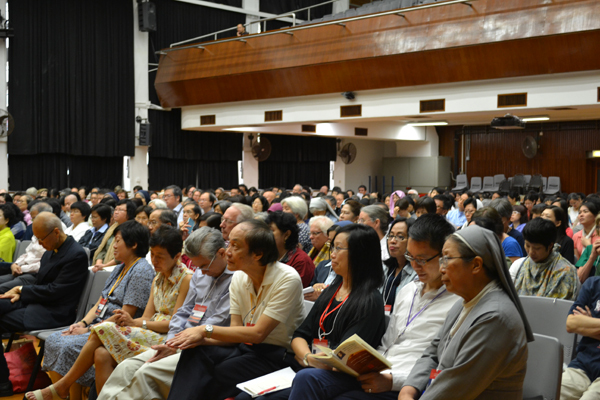 The John Main Seminar is an annual event organized by The World Community for Christian Meditation since 1984 in various cities in the world in honor of John Main (1926-1982). 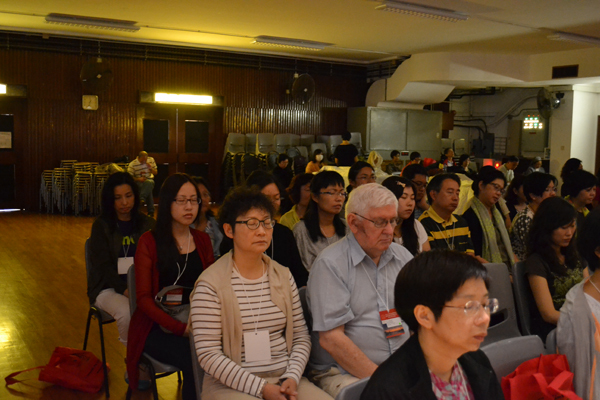 It brings together meditators globally and those who seek to discover the practice of Christian meditation. 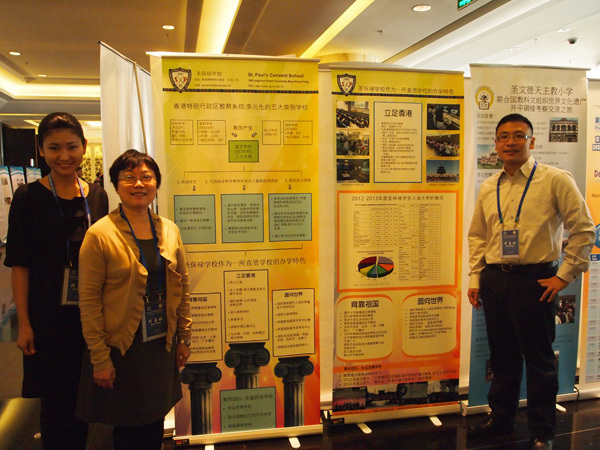 We are indeed very privileged to render our support to the community for hosting this year’s seminar for it is the first time that the seminar is held in China. 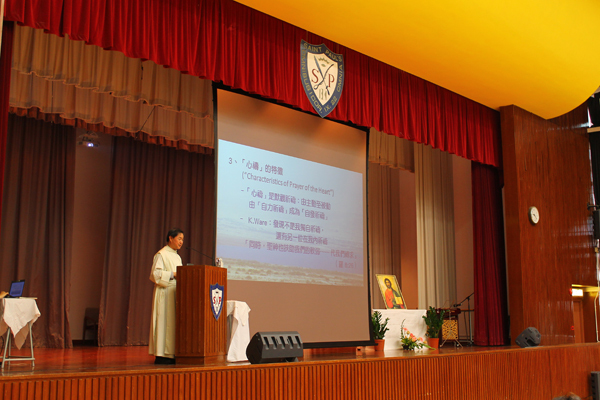 We are also grateful to Rev. 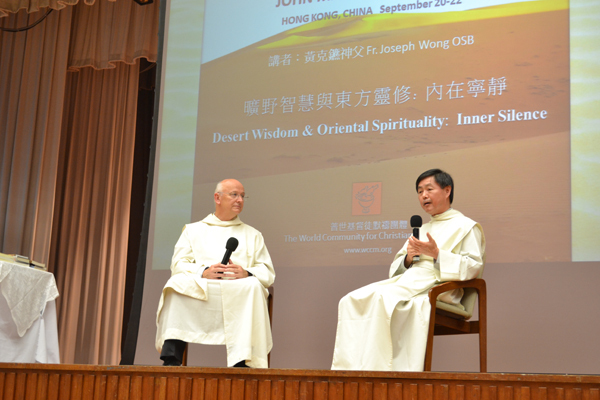 Joseph Wong, OSB Cam for leading us in the exploration of “inner silence” in the desert tradition and oriental spirituality. 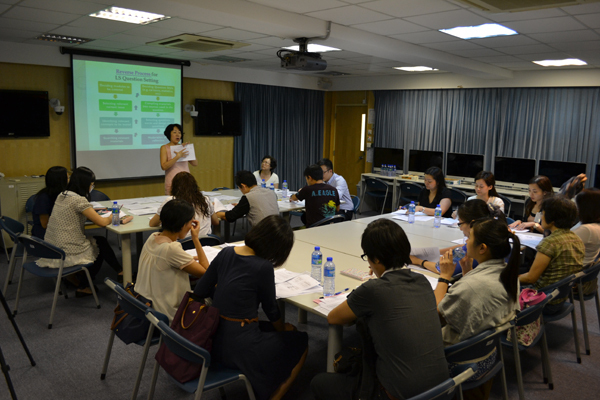 The first PDS seminar titled ‘Conceptualization: An Effective Pedagogical Tool in Practice’ was held on Wednesday, 28th August 2013, from 2:30 p.m. – 5:15 p.m. at the Media Laboratory, 6/F of SPCS. 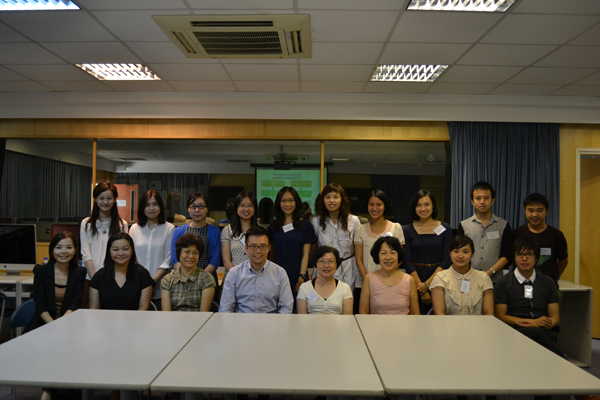 A total of 18 persons from our school and three partner schools, including 5 teachers from HKFYG Lee Shau Kee College, 3 teachers from Ching Chung Hau Po Woon Secondary School, 4 teachers from St. Stephen’s Girls’ College, 5 members from SPCS and 1 from EDB, attended the seminar. 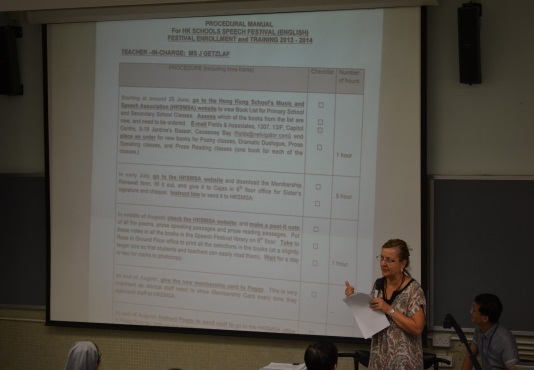 Teachers from all schools shared some questions from their past Liberal Studies exam papers and explained the rationale behind the design of the questions. Highlighting the use of question words, they discussed the performance of their students and the difficulties they faced in tackling the questions. 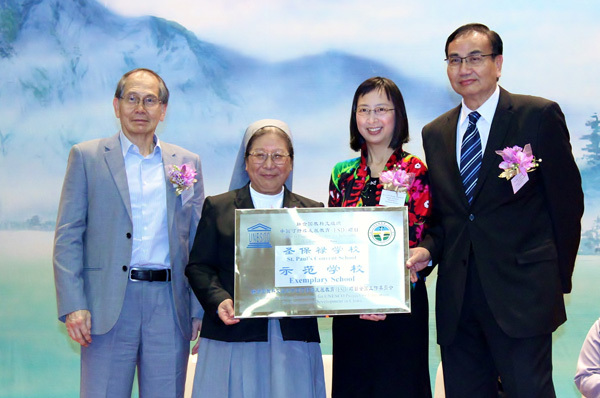 Miss Regina Luk, the LS Panel Head, presented a historical review of LS in curriculum development and its role in Education Reform in Hong Kong. 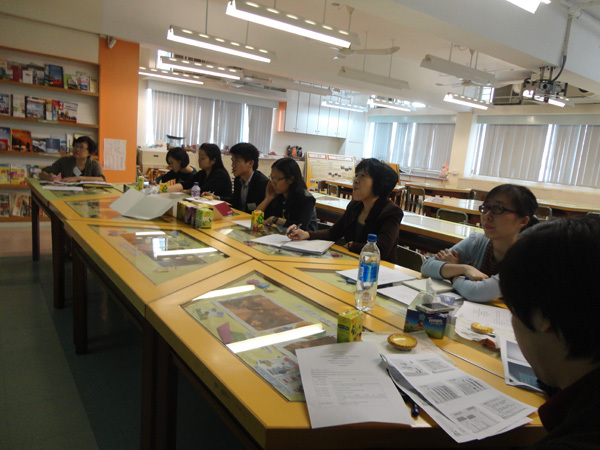 Teachers found the seminar very helpful, especially as they were able to get samples of exam questions and explore ways to solve problems in setting questions for exams. 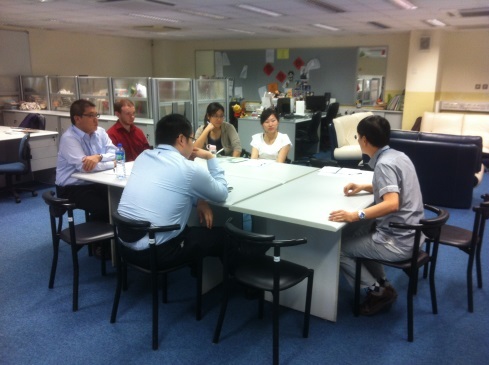 On 26 August 2013 we had a staff development programme in Room G7. 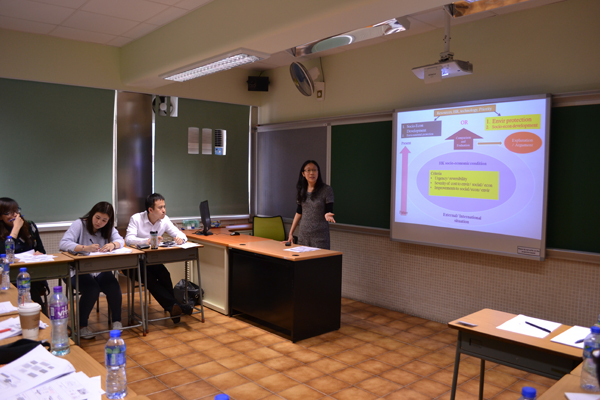 The programme focused on better understanding administrative procedures of the school. 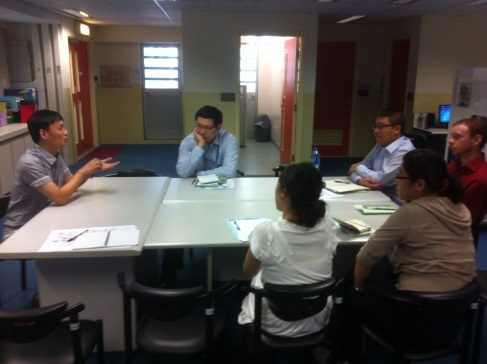 Teachers were invited to share their experiences in running different school functions and programmes. 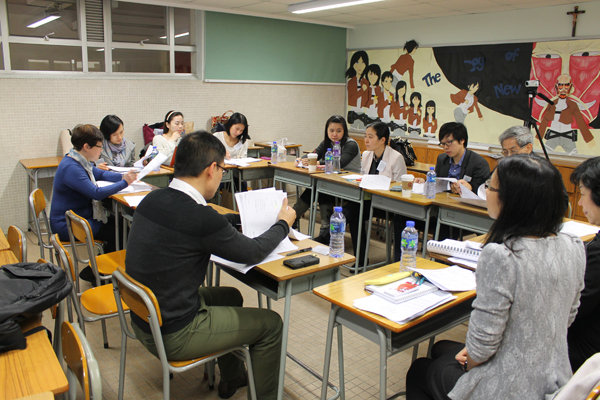 Our new teachers attended a series of New Teacher Induction Programme from 16th, 19th-22nd, August 2013. 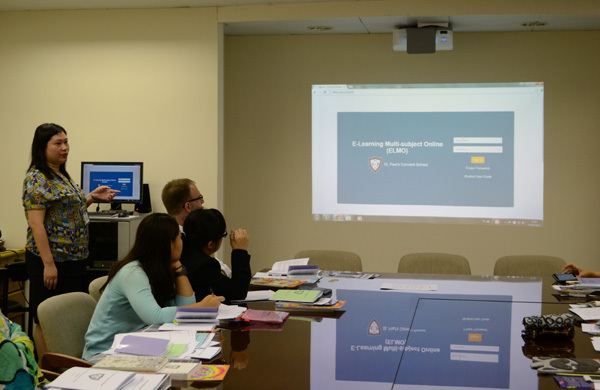 The programme introduced to them school culture, school administration, how to prepare a good lesson, IT and IWB training. 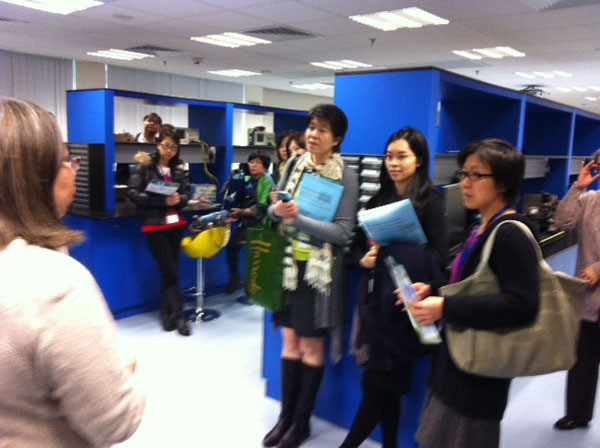 It has helped them familiarize with their working environment. 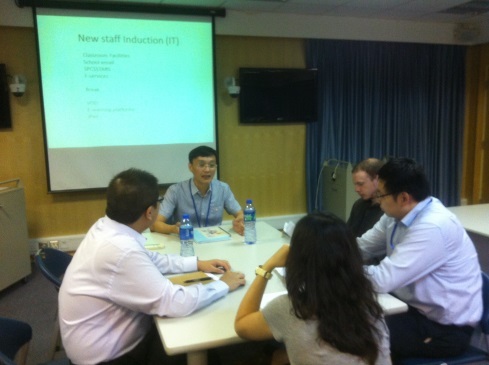 They all joined the induction and the feedback was very positive.